If The Dalai Lama Resigns Will Things Get Worse? The Dalai Lama has threatened to resign as leader of Tibet’s exiled government if violence in his homeland spirals out of control. The Nobel Peace laureate made the comment Sunday at a news conference in Seattle, Washington, where he has been attending a five-day “Seeds of Compassion” conference. The exiled Tibetan spiritual leader denied Chinese claims that he has called for Tibet to split from China and that he is behind the recent turmoil. He said the whole world knows that the Dalai Lama is not seeking independence or separation. 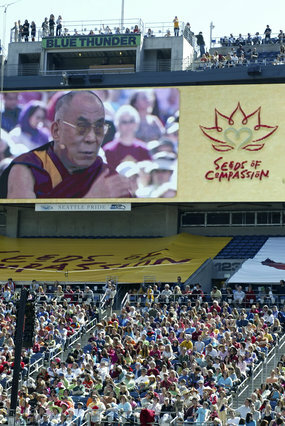 Also Sunday, the Chinese media accused the Dalai Lama of encouraging violence in a drive for the region’s independence. The international community is urging China to open talks with the Dalai Lama. German Chancellor Angela Merkel has promised to meet the Dalai Lama. Their last meeting strained relations between Germany and China. The Chinese Communist Party has the ability to change and China is becoming a global powerhouse, the Dalai Lama said Sunday in Seattle. But the Tibetan spiritual and political leader stressed that trust is necessary for any country to be considered a superpower. He gave those remarks in a press conference before attending a meeting about compassion and philanthropy. The world’s most populous country, he said, has the people, military strength and economy to elevate it to a higher level in the international community. Beijing goes on verbal offensive against activists, Nancy Pelosi: Beijing has gone on the offensive against western critics of its handling of the riots in Tibet by slamming US politician Nancy Pelosi as “the least popular person in China” and labelling the Tibetan Youth Congress as the No1 common enemy of humankind…. There will be a vacuum if this Dalai Lama resigns. I have encouraged his resignation to allow a younger Dalai to take over the reigns of this conflict. That would allow this Dalai to continue to travel and spread teachings of for a more spiritual, compassionate and peaceful lifestyle. The pressure on this Dalai must be intolerable. He wants autonomy for his people, but he wants to avoid inspiring a full out civil war. Civil war for Tibet would cause full out genocide by a hard line Chinese Government. Tibet “can make no more concessions”. The Dalai Lama’s opposition to China’s occupation of Tibet has won him admirers the world over. But although he is often perceived as the embodiment of compassion and fortitude in the face of oppression, he is not without his critics. According to Corey Flintoff of NPR, the lama “is sometimes reviled for his willingness to accept that Tibet should remain tied to China.” In addition, many were surprised in 1998, when the Dalai Lama spoke in support of India’s nuclear weapons tests. New Delhi, April 13 With Congress MP Rahul Gandhi in the audience, Robert Thurman, the West’s first Tibetan Buddhist monk, chose to touch upon issues on Sunday on which the government has maintained a studied silence: China’s crackdown on Tibet. A middle path, which is neither complete surrender nor extreme violence, is what Thurman, the first westerner to be personally ordained by the Dalai Lama in 1965, had to offer as an answer to the ongoing crisis between Tibet and China. On Sunday, Thurman, a long time friend of the Dalai Lama and an expert in Tibetan Buddhist studies at Columbia University, stressed on a dialogue between the Chinese government and Tibetans to put an end to the crisis. “Dalai Lama is loved around the world and he is realistically offering things to China. He is not against anyone… There could be peace and it could be worked out for everyone,” he said, delivering a lecture at the India International Centre. Referring to India’s persistent stand for a peaceful dialogue even after the Samjhauta Express bomb blasts, Thurman said this was the way to go. “Once nations say we will check violence but not let violence derail talks, terrorists will go jobless,” he said. Referring to rich mineral, agricultural, herbal, and water resources in Tibet, Thurman said Tibet could benefit immensely if it invited foreign mining investors. “Tibet would certainly be a very plum tourist destination,” he remarked. Bob Thurman has the ‘Middle Way’ vision, as does the Dalai. For those who respect and depend on the Tibetan Buddhist teachings to calm their lives, this conflict is heartbreaking. Not wishing ill for the Chinese people, but terrified that more violence will lead to a genocide agenda implemented by their government. Perhaps what the government fears will happen anyway. Those Chinese not convinced about CCP doctrine will be shamed by government behavior. China, the country, is on the front step of respectability. The CCP may just push China back down …. BEIJING — As Chinese security forces blanketed Tibet and other Tibetan-inhabited areas over the past month, the regular army remained discreetly in the background, under orders to let police take the lead in suppressing the unrest that exploded in Lhasa and quickly spread to adjoining provinces. This article demonstrates that the Chinese government was concerned, early on, how they responded to the protests could effect their image and hurt the Olympics. The resulting news stories are all skewed, depending on which ones you read. Bottom line, scrutiny will magnify every action each side makes. A real dialog is they only acceptable solution. Mediation and compromise are true qualities of statesmen and advanced civilization. Clari, the Dalai has claimed he would forgo the reincarnation sequence. In December of last year, “FACED with Chinese plans to seize control of his reincarnation, the Dalai Lama has come up with two revolutionary proposals – either to forgo rebirth, or to be reborn while still alive. The exiled Tibetan Buddhist leader has proposed to hold a referendum among his 13-14 million followers around the world – before his death – on whether he should be reincarnated.” It seemed to me that he would allow another authority responsible for selecting his replacement. Thats why I took him seriously.